Stocks and broths form the basis of many dishes in any kitchen. Although in today’s world of fast-paced and pre-fab meals, many home cooks have forgotten how useful a good stock can be. 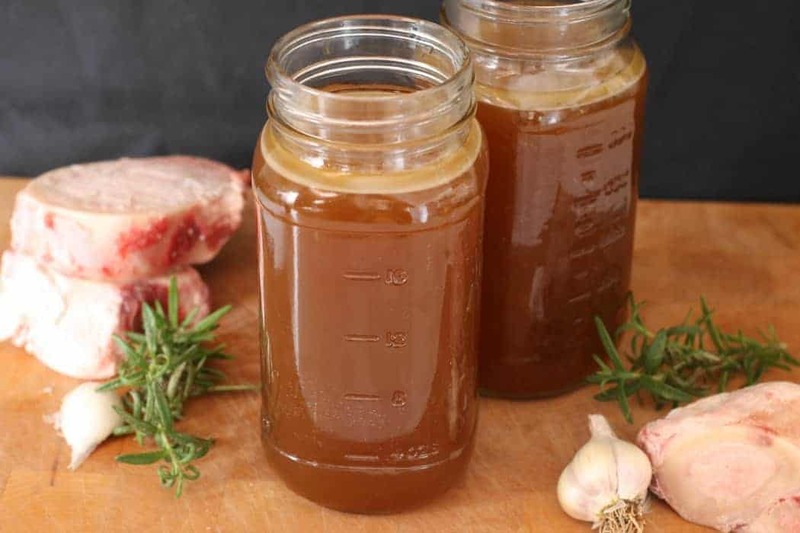 Learning how to make high quality beef stocks and broths at home isn’t hard. A simple recipe full of health benefits, stock is used in soups, sauces, and many other recipes. It’s what makes stock so wonderful. The ideal tool to enhance your cooking by using up any leftover scraps from chicken, beef, lamb, fish etc. 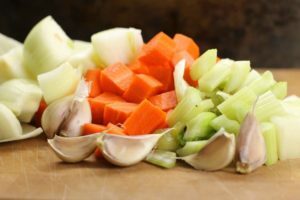 Beef stock and chicken stock are the most commonly used stocks, either in soups, as a base for sauces or to add some extra flavor and nutrition when cooking rice. The possibilities are endless and I want to show you just how easy making stock at home can be. Stocks and broths, are packed with nutrition. Due to their high gelatin content, stocks, especially beef stock are an exceptional addition to anyone;s diet who suffers from joint problems. Joints and muscles in both animals and humans are held together by what’s called connective tissues ( Collagen & Elastin). These tissues are essentially the glue that hold our muscles and joints together. Collagen a connective tissue that breaks down into gelatin in water, is crucial to our joints proper functioning. When simmered in water the bones and tissues break down and release many important minerals that our bodies need to work. These are just some of the elements present in stocks and broths. 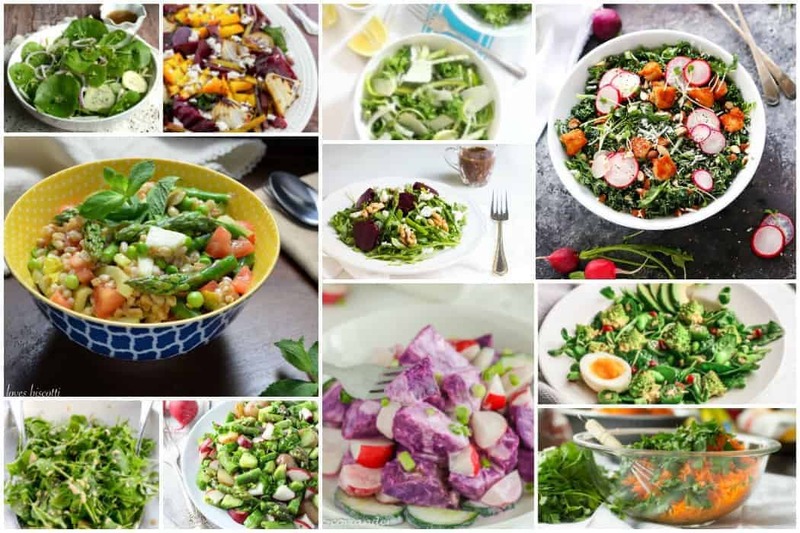 These minerals help reduce inflammation in our joints, boost digestion in our gut flora, strengthen our immune system, and benefit the metabolism. 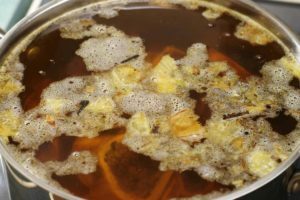 Unfortunately, store-bought stocks and broths, don’t contain many of these elements and are packed full of salt and MSG. No, to get the health benefits of stock you need to make this staple yourself. But like I said it’s actually very easy! 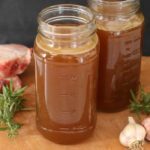 The easiest way to make beef stock at home, is to simply start buying cuts of beef that still have bone attached. While the best bones for making stock come from the knuckles, shank and bones with a lot of joint tissue, any bones will do the trick. Just like when you are making chicken stock, simply save and freeze the bones after removing the meat you want to use. When you have enough bones saved to fill your largest pot, you are ready to go. 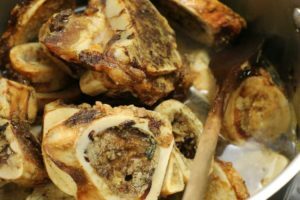 You can make a white stock (primarily used in soups and making veloute), by using the raw bones and not roasting them first. Otherwise to make a dark, rich flavoured stock, roast the bones until they are a dark golden color. Using a roasting pan, roast the bones in the oven at 375F for at least 45 minutes. As I mentioned the bones and all the meaty bits should be a nice dark brown color. Make sure to strain and save any fat in the bottom of the pan! While not as popular as it used to be, this pure beef fat(also known as lard) can be used to cook with and is especially great when frying at high temperatures. 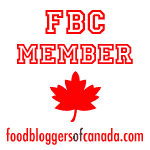 Ideal if you are on a paleo diet and not using vegetable oils. 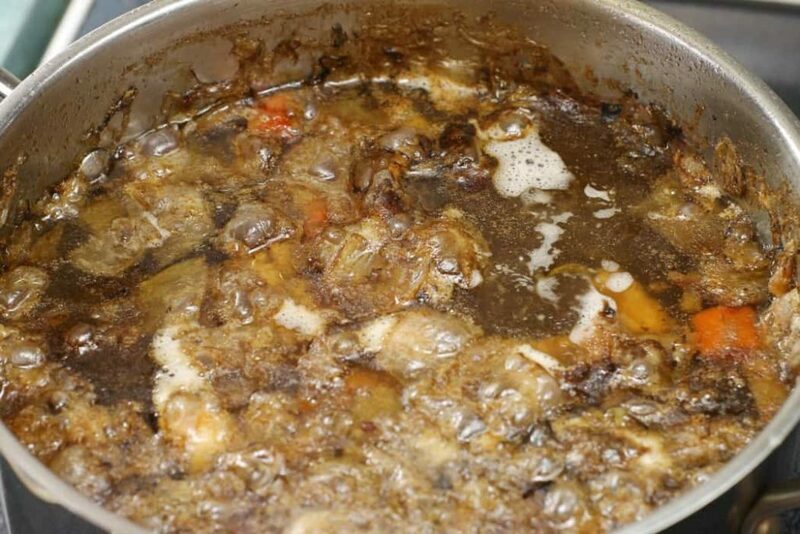 Place the roasted bones in your stock pot (or any other pot) and add the vegetables to the mix. Most recipes will tell you to roast the vegetables along with the bones, but I find they often burn and add a bitter flavour. If you like they can be added to the roasting pan in the last 15 minutes of roasting to brown them up just a little. The same goes for the tomato paste, I add it right to the pot, and don’t roast it to avoid bitter flavours. Once you have the roasted bones, vegetables and the rest of the seasonings added to the pot, cover everything with cold water. The recipe calls for 8 litres but you want to make sure you have at least 2 inches of water above the bones. Turn on the heat, and bring the beef stock to a simmer. Be careful not to boil the stock (though it will not hurt it!) to avoid the stock from becoming cloudy. Now for the easy part. Simmer the stock for 6 to 8 hours. Yes, you read that correct. This is an all day event, so set your timer and forget about it for the next few hours!. Every time you happen to walk by just skim of that foam that rises to the top. I have even set the stock on and let it simmer over night. Strain the beef stock through a fine mesh strainer(affiliate link) or cheesecloth and let it cool in the fridge. Fat will rise to the top creating a natural airtight seal, helping to keep the stock fresh. You can also pour the stock into ice cube trays once cooled, and freeze it for easy access and use in future recipes. 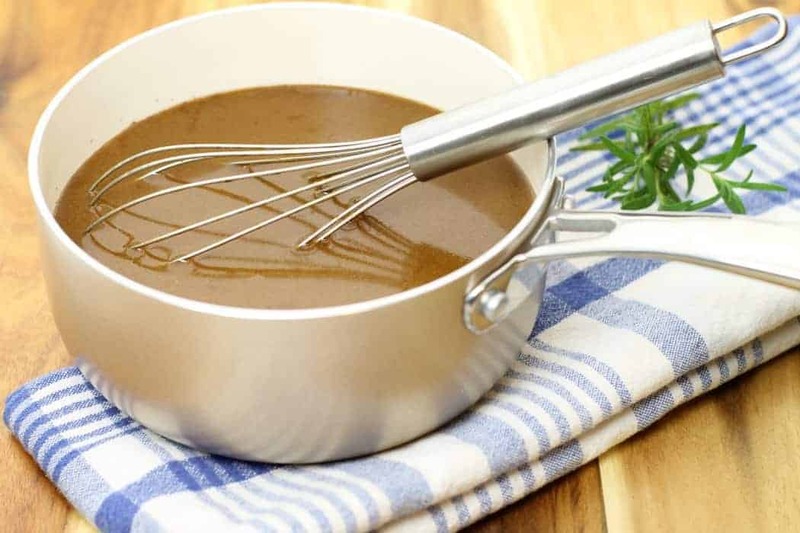 Beef stock is great when used to make hearty soups, (such as my German Goulash) and is essential for making a good Espagnole Sauce and other gravies. Making high quality beef stocks and broths at home isn't hard. A simple recipe and full of health benefits, stock is used in soups, sauces, and many other recipes. Roast the beef bones in a pre-heated 375F oven for 40 minutes or until dark golden brown. While the bones are roasting, prepare your stock pot, and caramelize the mirepoix until nice and dark. Add the roasted bones to the mirepoix in the pot and add any herbs, spices or specific seasonings you desire. Cover the contents of the stock pot with water making sure there is about 2 inches of water (at least) covering the bones. Simmer the beef stock for 6-8 hours, skimming of any foam that rises to the surface. Ladle the simmered beef stock through a fine mesh strainer or cheesecloth, and cool for use in other recipes. To make a white stock, skip roasting the bones and caramelizing the vegetables. simple put everything in the stock pot raw and proceed as normal. Can you bottle it using a canner to preserve it for longer time frames or can you only keep it in the fridge? You certainly can! I actually used to do this while working in Switzerland. We would can all our stocks in mason jars and store them in the cellar. this way we could make large batches of stock at once, and store it while having minimal fridge space. Thanks for pointing it out Chris!